With the publication of the 4th Intergovernmental Panel on Climate Change (IPCC), it should now be clear to everyone that climate change is one of the most serious issues facing humanity. Even President George W. Bush, after almost a decade of denial, has mentioned the dreaded words 'climate change'. The facts speak for themselves. China’s glaciers are diminishing each year. If they disappear, from where will the 250 million people who depend on their melt-waters get water during the dry season? Australia is now in the grip of a severe drought which is, most probably, due to global warming. Will there be enough water to support the population of Perth or Sydney? A rise of one metre in the sea level would make it impossible for over 30 million Bangladeshis to live in the delta area. A significant rise in sea-levels will inundate many of the cities of the world and create a torrent of environmental refugees. The 2500 scientists who compiled the IPCC document have done humanity a huge service. It is now clear that there is a direct relationship between burning fossil fuel and climate change. The report from the economist Sir Nicholas Stern came to similar conclusions about the pressing need for a change in how we manage our environment. According to Strern, global warming is the greatest failure ever of market economics. He argues that from an economic perspective, it is crucial that we take remedial action immediately. His report shows that if we tackle it now it will only cost about 1% percent of the global gross domestic product (GDP). If we leave it for another 10 or 15 years it could cost in the region of 5% to 20% of global GDP. 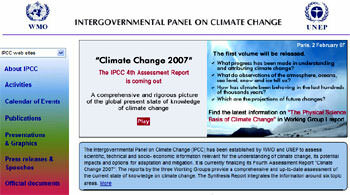 I attended the UN Climate Change conference at Nairobi in November 2006. I noticed that almost all the negotiations around climate change quoted scientific, political and economic data but seldom mentioned the core ethical values involved in any human activity, particularly a destructive one like emitting greenhouse gases. One of the first ethical principles is identifying those who are responsible for the damage caused by climate change. This principle states that a nation cannot use the excuse of minimizing the cost to its own economy as an ethically acceptable reason for failing to take actions on their greenhouse gas emissions which affect the entire planet. This is the reason that President George W Bush and Prime Minister John Howard gave for not signing up to the Kyoto Protocol. If we reduce the ethical reflections to manageable proportions, the moral implications of climate change become more evident. For example, if I persisted in pouring a substance into another person’s house which made it impossible for them to live there, I am sure that reasonable people would come to a number of conclusions very quickly. Firstly, that what I was doing was morally wrong. Secondly, that my excuse that it was necessary for my economic growth would be morally unacceptable. Thirdly, that I should desist immediately. Fourthly, that I should pay compensation for the wrong that I had wrought. Richer industrialised countries, who are mainly responsible for releasing greenhouse gases into the atmosphere over the past 200 years, should be obliged to pay compensation for climate change damages that are unavoidable. In a spirit of global solidarity they are also morally bound to make resources and new technologies available to poor communities so that these countries can adapt and enjoy a decent standard of living without adopting the polluting, Western model of development. When it comes to allocating global emissions among nations—the 'polluter pays' principle—is consistent with the demands of distributive justice. This means that there is an ethical imperative incumbent on every nation to try to promote sustainable development policies. Faced with the disruption which climate change will bring, everyone must assume their responsibility by cutting their carbon emissions. President Bush and Prime Minister Howard have used the excuse of scientific uncertainty with regard to climate change to avoid cutting greenhouse gas emissions. This excuse transgresses basic ethical norms. When there is a possibility that activity, in this case burning fossil fuel, will cause great harm then the precautionary principle dictates that nations take precautions not to harm other nations. In the wake of the recent IPCC report there is now very little scientific uncertainty about global warming and climate change. On the theological level as Christians we are called to care for God’s creation. Climate change is upsetting the natural cycles upon which God’s creation – animal, plants and humans - depend. Sometimes we forget that humans depend on the natural world for almost everything. Recent articles by Sean McDonagh. This is a great article which explains the issues succinctly. But doesn't the church now have a role to play in calling for a radical shift away from fossil fuel and the adoption of renewable energy, and also new measures to curb population growth, especially in developing countries? How sad that so called developed countries like aust have in the name of profit have forsaken the most fundamental of fundamentals-LIFE without diversity there is EXTINCTION. Capitalism relies upon insatiable wants with limited resources...but water is not a want it is a NEED like housing and clothing...and yet we still have not found a viable solution...it begs the question- is Australia really a developed country? Throwing money at water is not the only way to fix our current problems. Reflecting on some of the meandering and non-linear qualities of water, and seeking to emulate them, may be a starting point for more receptive and sensitive ways of being in the world. In the past six months, climate change has gone from an idea which may have some future relevance to something which is already happening around us. Each region of the world seems to have had its own epiphany over climate change.